Mombasa will always have a special place in my heart. I was born on this beautiful coastal city with its sun soaked white sand beaches, warm azure waters fringed with colourful coral reef and shaded with the emerald green of the coconut trees. It is seeped in Swahili history and there is just so much to see and do on this sun basked island. Here are my top picks. Fort Jesus is a gorgeous fortress built between 1593 and 1596 by the Portuguese and which is now classed as a UNESCO World Heritage site. Perfect spot for history enthusiasts, it has so many artefacts and remains to see such as cannons, a skeleton and it has the most amazing views of Mombasa. In terms if design it was built to mirror a person lying on their back and has Portuguese, Arabic and British influences, each from different times of rule during the different eras. It is definitely worth a visit to see the magnificent architecture and to see some of the artefacts they have preserved there. Mombasa is a coastal city and has some lovely beaches to go spend some time unwinding and relaxing in the sunshine. As Kenya is close to the equator, it is blessed with warm weather all year round. It is great for water sports too if you fancy jet skiing or any other activities. Jumba la Mtwana, or Jumba Ruins as it is more popularly known as, is a hidden historical site found in the buzzing town of Mtwapa, popularly known for its Creekside restaurants and beautiful sea views. It is well worth a visit and has a gorgeous restaurant on site, and beachfront, called Monsoon which is an absolute must if you love seafood. You can read about both here. Tamarind Mombasa is a great place to unwind and enjoy a drink or two. With its enviable location, it is definitely a great venue to soak up some rays as well as escape from the hustle and bustle of the traffic on Nyali Bridge. Trying the local beer, preferably with a view of the sea is a must! Best served chilled and definitely very popular with anyone who visits Kenya. Yes a floating restaurant which is just stunning and a great place to spend a lazy afternoon. You can even take a dhow from here if you fancy something special! They make incredible Dawas, which is a must try local cocktail. You cannot visit Mombasa and not try the famous Mogo (cassava) or Makai (corn on the cob) on Mama Ngina Drive, popularly known as “Lighthouse.” I have a whole post dedicated to food in Mombasa which you can read here. 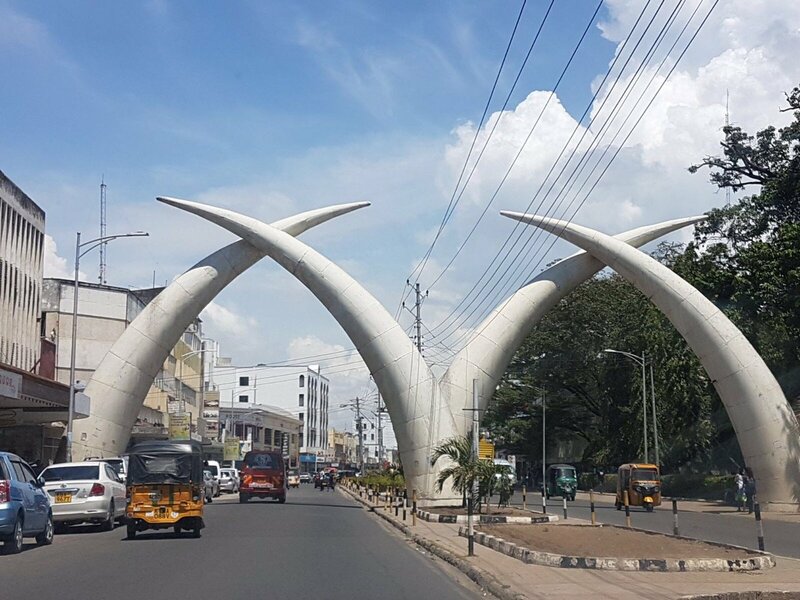 These iconic tusks were commissioned in commemoration of a visit to Mombasa by Princess Margaret in 1956 and have stood proudly on Moi Avenue ever since. Haller Park is a success story whereby a quarry was turned into an ecological paradise. It is worth visiting and you will get to see reptiles, as well as giraffes, hippos, zebras and so much more. You can read more about Haller Park here. Yuls, which is also known as Aquadrom purely out of nostalgia, is a fabulous beach front restaurant where you can have pizzas, pastas, burgers and sea food and amazing ice cream. It is a great place to spend the afternoon and if you are into watersports, you can hire jet skis amongst other things from here. Take a Ferry ride to Mombasa’s South Coast, Diani which promises you stunning beaches, aqua blue water and gorgeous resorts. I recently stayed at Swahili Beach, which you can read about here, but there is a plethora of amazing hotels to choose from. A Kanga, which is a colourful cloth that can be worn as a skirt or sarong, is perfect for the beach and you would be spoilt for choice with the array of colours and designs that are available. Usually found sold on the beach they are a great accessory to have and inexpensive too. With narrow streets, old buildings, gorgeous doors and antique shops, old town is a wonderful place to explore to see the influences of the various residents, such as Asians, Arabic and European. There are some great cafes and coffee shops where you can take a break too. Have you been to Mombasa? What were your highlights? I would love to know in the comments section below. This sounds like an amazing place Binny!